The Dewey Decimal Classification(DDC) is a numbering system used by librarians to find and shelve books. There are 10 major categories of numbers. For example Geography and History subjects are located in the 900s. These 10 categories are then divided into subsections also by 10s. All non-fiction books are shelved using the DDC. Watch the video below to help understand how the Dewey Decimal System Works. Nonfiction is a genre of books that contain facts and information about various subjects. Check out the children’s nonfiction section to find books ranging from sign language to science experiments to sports, history, animals and more! Use the chart below to help you decide what area of nonfiction you are interested in reading about. Please note that a few titles in each of the lists below are not nonfiction. To find out, click on the book title and look for a call number that contains numbers. Example: J 910.4 WRE. Also note that the list generated for each subject contains books from all reading levels. 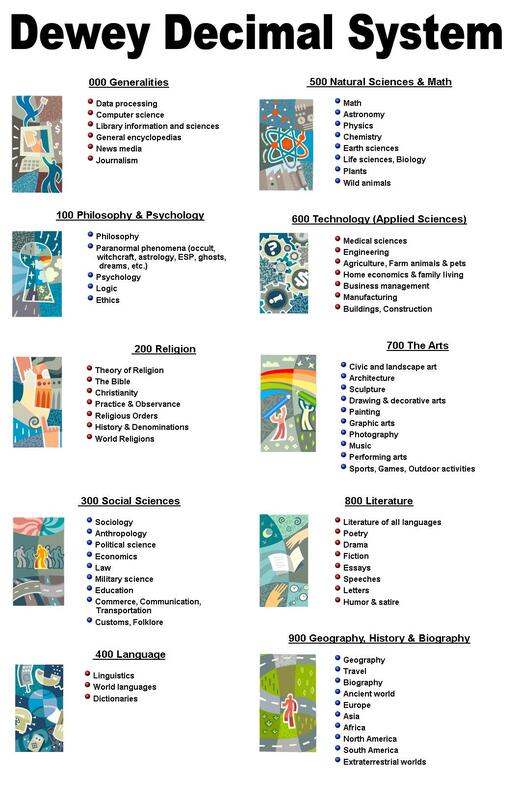 I love the graphics you’ve used to illustrate the Dewey sections. Do you know where those came from? Our former Public Relations person put that together. I believe she may have used graphics from Microsoft Office when they were still available through the software.